Blinds Cleaning :: My Cleaners London - Only professional cleaning! Keeping the blinds of a home clean and beautiful is essential. 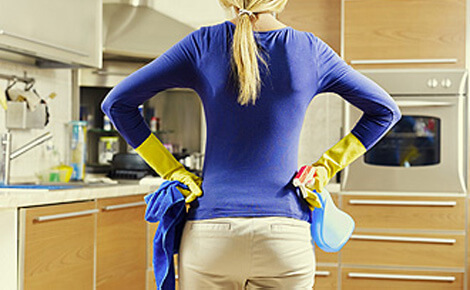 They add to the charm and to the inviting air of the home, and although cleaning them may be a time consuming process, it should be carried out at regular intervals, to prevent the accumulation of too much dust and dirt which become harder to remove when the blinds are not cleaned for a long time. Blinds are made of different materials: metal, plastic, wood, and vacuuming is the best method of cleaning to remove the dust. The vacuuming using the vacuum cleaner brush attachment is very efficient to remove all dust particles. To obtain the best results, people should close the slots in the blinds to form a uniform surface and thus be able to reach the most of the blinds area during the vacuuming. There are also spots that form on the blinds, such as finger marks, or spots where dirt builds up. After the vacuuming such spots should be specially treated. The dirty spots should be wiped with a damp sponge. Water can cause additional stains on the blinds, so after the spots have been rubbed off with the sponge, the surface should be wiped dry. Some blinds are made from materials that are damaged by water, and it is not recommended to wash them. Such types of blinds comprise wooden blinds and blinds decorated with decorative tape, for example. Immersing them in water can damage them. Wood is especially prone to damage by water. Cleaning wooden blinds by washing them should be avoided. Plastic and metal blinds can be washed to remove the dirt and dust which have accumulated on them. Before that they should be vacuumed to remove as much of the dust as possible. But when plastic or metal blinds have not been cleaned for a long time and more thorough cleaning is needed, they can be washed after they have been vacuumed. Plastic and metal blinds can be washed to remove. Before that they should be vacuumed to remove as much of the dust as possible. But when plastic or metal blinds have not been cleaned for a long time and more thorough cleaning is needed. They can be washed after they have beenvacuumed. Gentle brushing can be done when needed, using a soft brush. Then the blinds that have been washed in the above mentioned manner should be left to dry. The washing of plastic or metal blinds should be done in water which is mixed with a couple of drops of mild dish soap. With respect to the vessel in which blinds can be washed best, a bathtub is a very good place where they can be immersed in the water with soap. Gentle brushing can be done when needed, using a soft brush. Then the blinds that have been washed in the above mentioned manner should be left to dry. The cleaning of the blinds should also include the cleaning of the cords and ropes. They should be washed too, as they tend to accumulate a lot of dust as well. In some cases, washing may not be enough to restore their white clean look. In such cases after these elements have been washed and dried, they can be whitened with the aid of white shoe polish.